St. Louis Police Veterans Association historic photo website. With the recently begun demolition of the mixed use building at the southeast corner of Page and Union Boulevards, the last building that defined this intersection, I decided to reach into my archives from the 1990's for a look at a landmark just across the street that was lost over a decade ago. When originally proposed in 1907, the The Twelfth District Police Station met with objections from residents of the City's fashionable West End who did not want to see a building with bars built in their neighborhood. 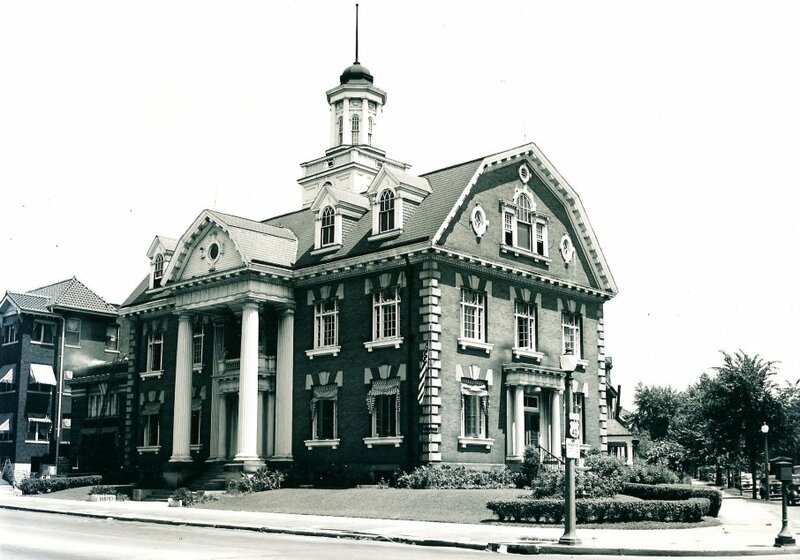 To satisfy the residents concerns St. Louis Building Commissioner designed a three story colonial revival structure with a gambrel roof which made the building look more like a mansion than a police station. The building included a gymnasium on the 3rd floor and an attached stable for the mounted patrols. The building was used until 1963 when stations were consolidated, but re-opened in 1966 at the request of residents. 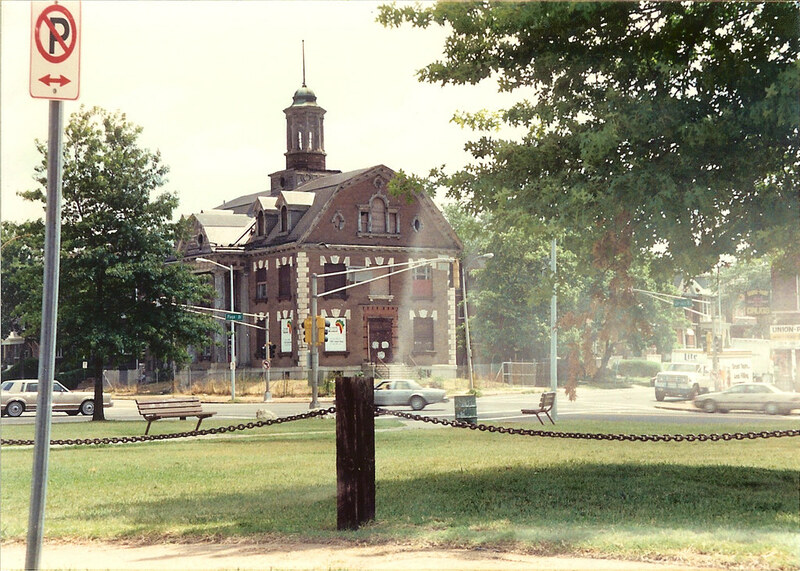 In 1973 however the district headquarters was relocated into a smaller building on Enright several blocks to the south and the old station became vacant. The building was placed on the National Register of Historic Places in 1980. On the night of July 5th, 1993 a six alarm fire suspected to have been started by errant bottle rockets caused extensive damage to the building, with the cupola collapsing down to the second floor. 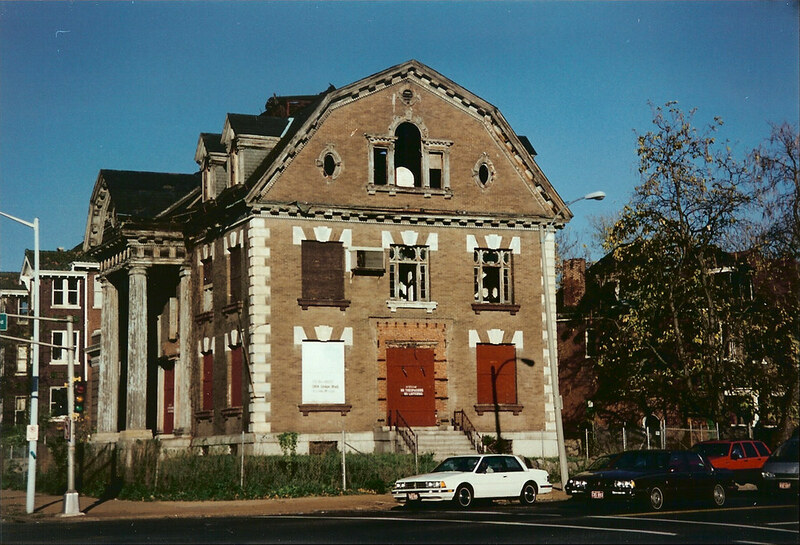 although there was no damage to the masonry shell of the building, and much of the roof remained intact, the building was considered a "total loss"
For several years prior to the fire the building had been proposed for re-use as an African American Cultural Center, a project that almost two decades later unfortunately has yet to come to fruition. The most recent proposal for this project includes renovation of an old church building with a large addition across from the Pageant Theater on Delmar. 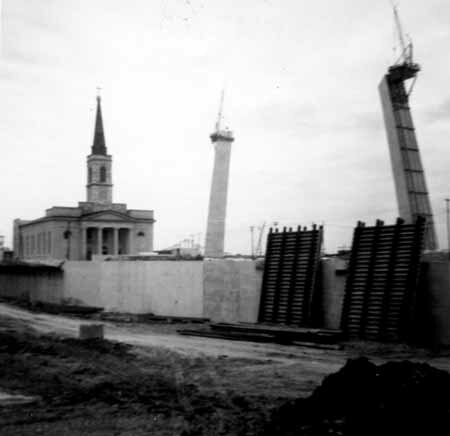 The building was demolished in January 1997 and the cleared site was converted to Marie Fowler Park. Strangely in the pre-fire photo above it appears that there may have been a park on the southwest corner of the intersection. Bartmer at one time came all the way to the intersection of Page & Union, but was cut off and cul-de-saced. I am not sure if the green space created was actually designated a park. Today this corner is occupied by an anti-urban Walgreens with the parking lot on the corner, so it would appear that the city traded a park for a Walgreens and a landmark building for a park. 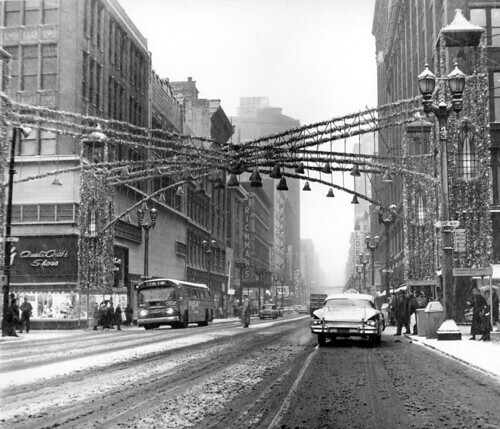 Following up on my previous post about pre St. Louis Centre retailing is another view of 6th & Washington looking west in the mid 1960's from the Pyramid archives. As one of the epicenters of retail for Downtown St. Louis the intersection is fully decked out for the holiday shopping season including tinsel covered bell towers at the four corners. Stix Baer & Fuller is at right on the north side of the street. Further west can be seen the sign for Loew's State Theater, whose Washington Avenue lobby survived until the early 1990's when the convention center was expanded. All of the buildings on the south side of the street west to the Statler Hotel (now restored as part of the Renaissance Grand) have been demolished. In their place are the now vacant St. Louis Centre, the US Bank tower and parking garage and the new portion of the Renaissance Grand. At the southwest corner of the intersection two older buildings have received a modern slip cover with continuous storefront windows for a large shoe store. Beyond was Richman's, which was one of many smaller independent department stores that existed at the time. Happy Holidays everyone! 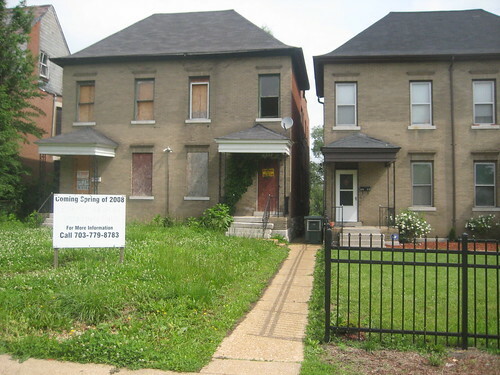 Baffled by Latest News From Detroit: 14 Schools to be Demolished! Whenever we might be feeling down about our City and the erosion of it's built environment, It seems like Detroit does something that makes St. Louis seem like a progressive place to be. 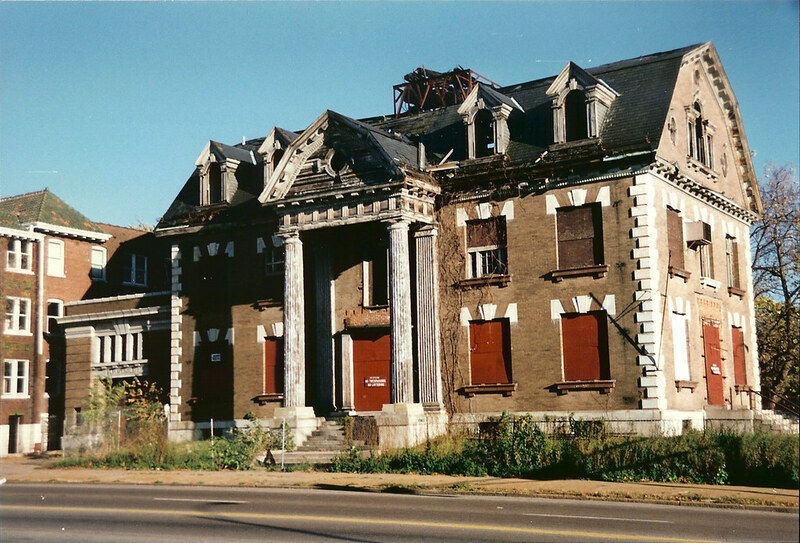 This week Preservation, the magazine of the National Trust for Historic Preservation reported that Detroit Public Schools will spend $33 million to demolish 14 historic vacant school buildings. Included in the proposal is demolition of the massive Cass Technical High School which will cost $6 million to demolish. 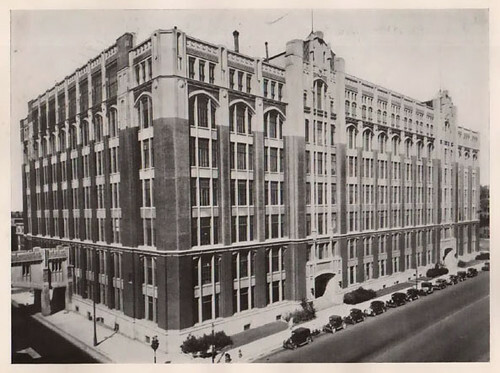 What makes this story really insane is when you realize that Detroit Public Schools abandoned the old Cass Tech and spent $93,000,000 to build a brand new 404,000 s.f. school right next door to the original building! 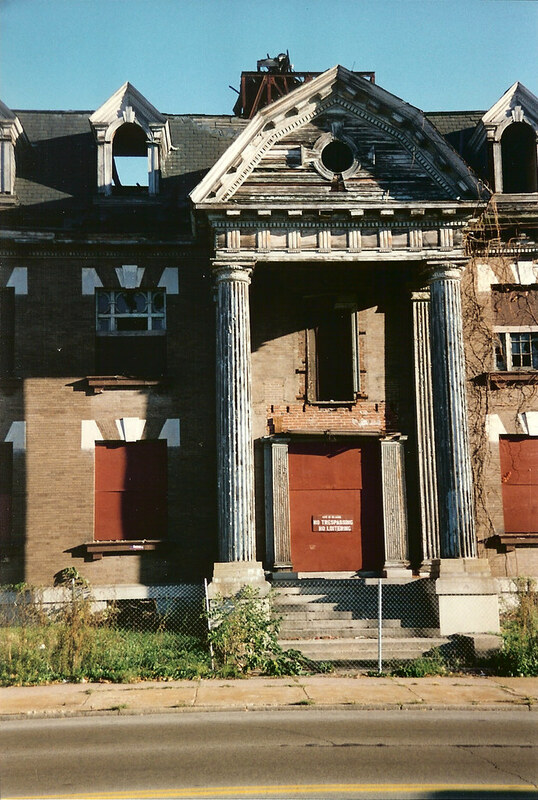 $33,000,000 would likely be enough to completely renovate at least 2-3 of the doomed buildings, and if combined with Federal Historic Tax Credits, private equity and other potential incentives or tax credits, could bring new uses and restoration to many more. Spending that much to only end up with nothing is a mind boggling waste of public money. The final agenda for Monday's Preservation Board meeting was put online today, and the proposed demolitions of 5305-07 and 5309 Cabanne have been removed from consideration. In recent months there has been what seems to be a reoccurring pattern of demolition proposals showing up on the initial agenda posted by the Cultural Resources Office (usually about 2 weeks out from the meeting) only to be pulled when the final agenda appears online, which usually occurs the Friday prior to the meeting. While pulling demolition proposals almost always come as a relief to me, I have been wondering why this is occurring? Is it just a fluke that this has happened several months in a row now, or is it something else? Are applicants realizing that they might face a fire storm of protest when they see their proposals show up on sites like this? I am not convinced of this, but one can dream. On the flip side, a completely asinine proposal to demolish a former St. Louis Carnival Supply building, a modified but still quite intact corner building, for expansion of an adjacent strip mall parking lot is still on the agenda for Monday. Please read more about this at Ecology of Absence. 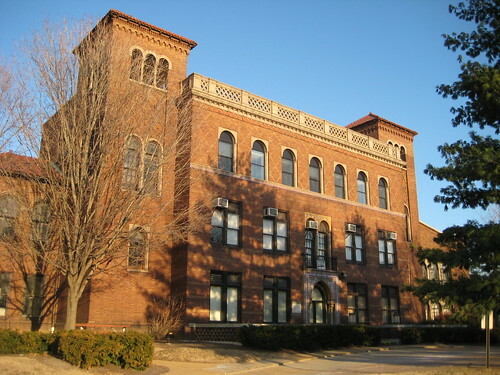 Next Monday the St. Louis Preservation Board will consider the demolition of 5309 Cabanne for the second time in three years. 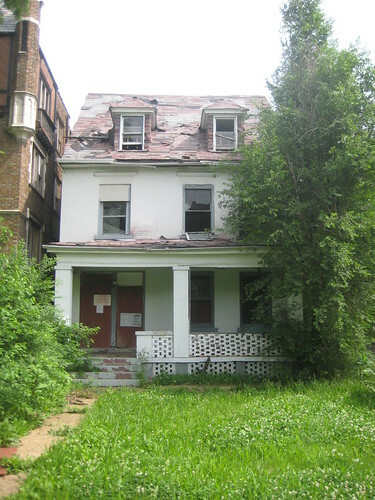 In August 2006 the Preservation Board turned town a request by Greg Vatterott to demolish the three story 2,800 s.f. single family home built in 1902. As the detailed agenda from that meeting shows, the house has suffered some partial collapse of the rear masonry wall. However, the rest of the home remains in relatively good shape. 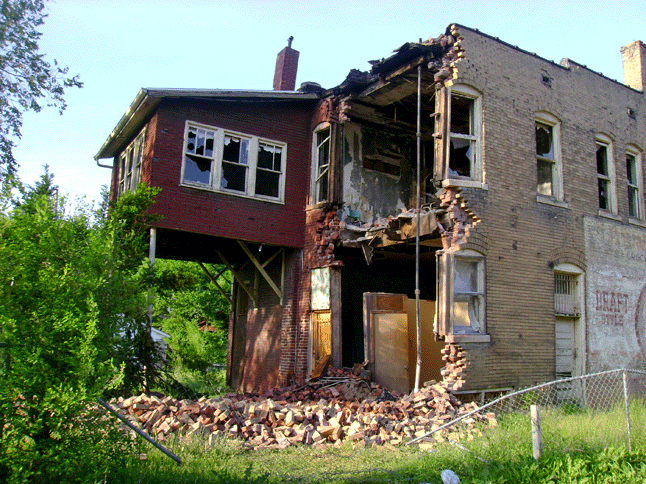 In 2006, the Board felt that the minor damage at he rear wall did not warrant demolition. Let's hope they come to the same conclusion next Monday. The applicant this time is Tap In Properties, LLC, a Leesburg, Virgina company that provides "Janitorial and Post-Construction Cleaning for the Washington, Maryland and Virginia area", which acquired the home in August 2007. "We are locally owned and operated so you can be assured you will receive quality dependable and honest service every time", states their website. 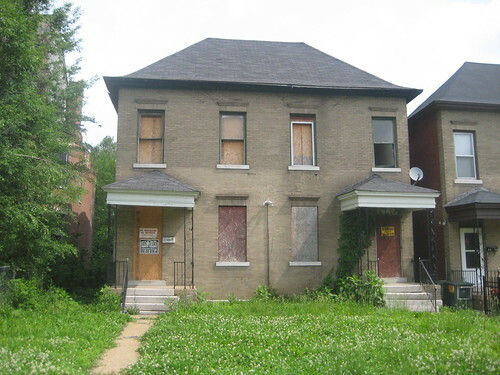 So what business do they have in tearing down historic homes in St. Louis, Missouri!?? The same applicant has also applied to demolish a neighboring two-family townhouse building at 5305-07 Cabanne. Unlike 5309, this building shows no signs of deterioration from the exterior. The faded sign in the front lawn that has been up for some time reads "Coming Spring of 2008: 3-Bedroom Townhouse Units" When I first saw the sign, I assumed that a renovation was going to occur. The buildings are located in the Visitation Park Historic District, and are therefore eligible for Historic Rehabilitation Tax Credits. I'm tempted to call the number and ask when the renovated units will be ready. A matching building at 5301-03 is occupied. The detailed agenda for the upcoming meeting has yet to be posted, so there is no information as to the details of the proposal, if any for use of the site. What will be the next threatened landmark? Will it be the former Shriners Hospital Building (above)? Will it be the Sun Theater? Will it be Mann Elementary School? Will you have a right to say anything about it? Please join the Friends of the San Luis Friday night for the Anti-Wrecking Ball Holiday Kegger. The Friends of the San Luis are presently appealing a ruling by Circuit Court Judge Dierker that stripped the right of citizens to appeal a Preservation Board ruling on the basis that they do not have legal standing to question any Preservation board action. 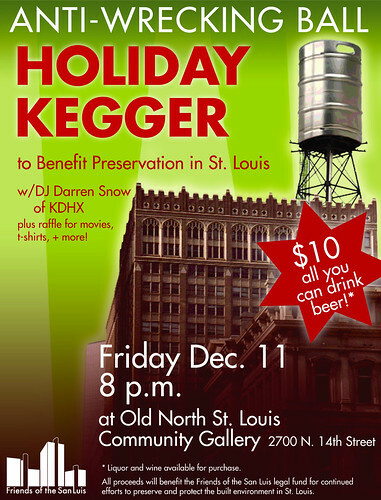 Come check out Old North St. Louis Restoration Group's newly renovated Community Gallery (one block south of Crown Candy), have some beer and support your right to fight for historic preservation in St. Louis. All proceeds will go to the court ruling appeal fund. St. Louis or Berlin? Construction of Interstate 70 in 1964. Yesterday and today were days of celebration for many St. Louisans as re-construction of Highway 40 (Interstate 64) came to a close and the highway re-opened to uninterrupted traffic from 270 to Kingshighway for the first time in almost two years. I couldn't help but think: Is the opening of a new highway really cause for celebration? 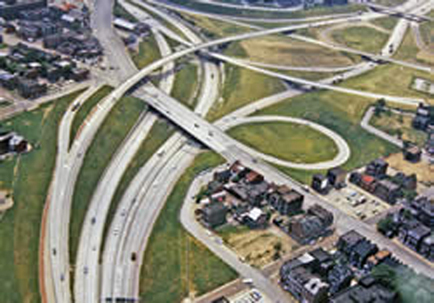 Since their inception in the late 1930's, highways have reeked havoc on cities, requiring mass demolitions, dividing neighborhoods, ruining parks and more all in the name of getting from A to point B a little bit faster. 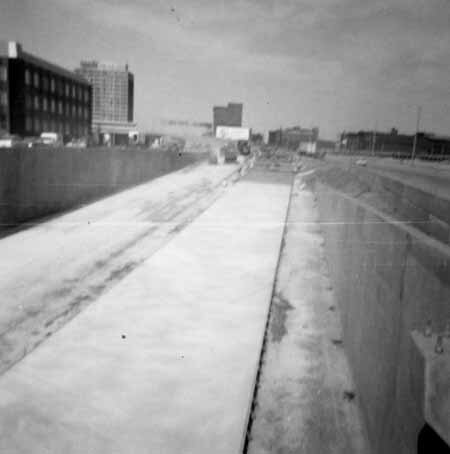 Construction of Interstate 70 (then also known as the Third Street Highway) cut off Downtown St. Louis from the Gateway Arch two years before its completion in 1966. To this day the highway remains a physical and psychological barrier as well as major source of noise pollution. Photos from UMSL's Western Historical Manuscript Collection. A relatively intact streetscape with buildings and park cars. 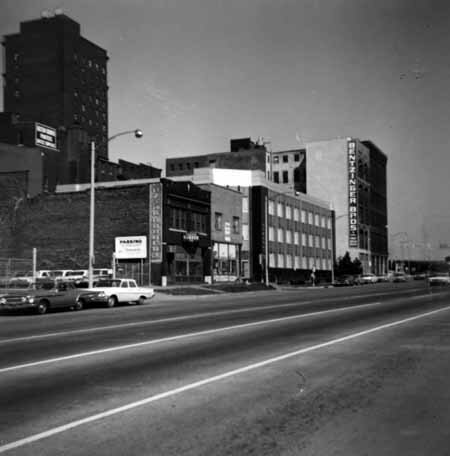 This is Third Street in 1962, prior to the construction of the Interstate 70. 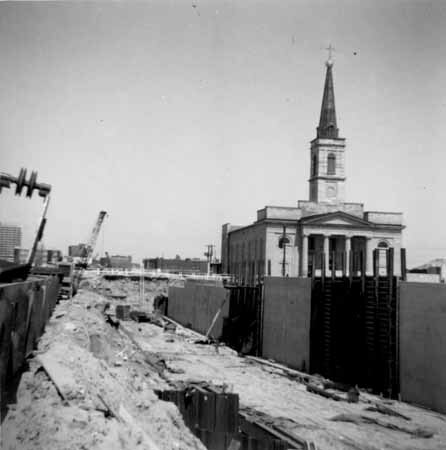 All building in this photo with the exception of the Peabody Building (at center with the corner entrance) were demolished to make way for the Mansion House complex. Like Mansion House, most of the buildings in this row front Fourth street and turn their back to the Arch grounds and riverfront beyond. Can you blame them? Who would want their new building to front a noisy ugly highway? Two years later in 1964, the interstate cuts a gash in the landscape cutting off everything from the yet to be completed Arch and grounds. Beyond the Peabody Building the Bel Air Hotel can be seen in the distance. City interrupted - the Interstate 44-55 interchange in the mid 60's. Construction of Interstate 44 and 55 destroyed block after block of fully intact South Side neighborhoods. Early plans for 44 even threatened Tower Grove Park by the highway's path. While the south edge of Forest Park was given a lobotomy, this treatment of Tower Grove would have completely destroyed the narrow park and would have devastated the adjacent neighborhoods. Back to Highway 40, another casualty of the re-opening is transit demand. This morning as I got on the MetroLink train at Skinker to head Downtown I noticed that the crowd on the train was much lighter than normal. I was not completely surprised by this. There was a noticeable increase in Metro rider-ship last January when the east half of Highway 40 closed for the year, and since Metro made service cuts in March, it has been standing room only on the trains at least until the Central West End where many BJC workers exit. Has everyone gotten back in their cars to take the new Highway 40? Maybe I am unusual, but when I made the decision several years ago to start riding Metro, it was one of the most liberating things I have ever experienced, leaving behind the traffic, dealing with other drivers on the road, parking garages, more frequent trips to the gas station and maintenance shops, etc. in exchange for some relaxing time to read a book. You can call me crazy if you want, but I actually liked standing on the train when is was packed with people. Somehow it made it feel like I was living in a real City. 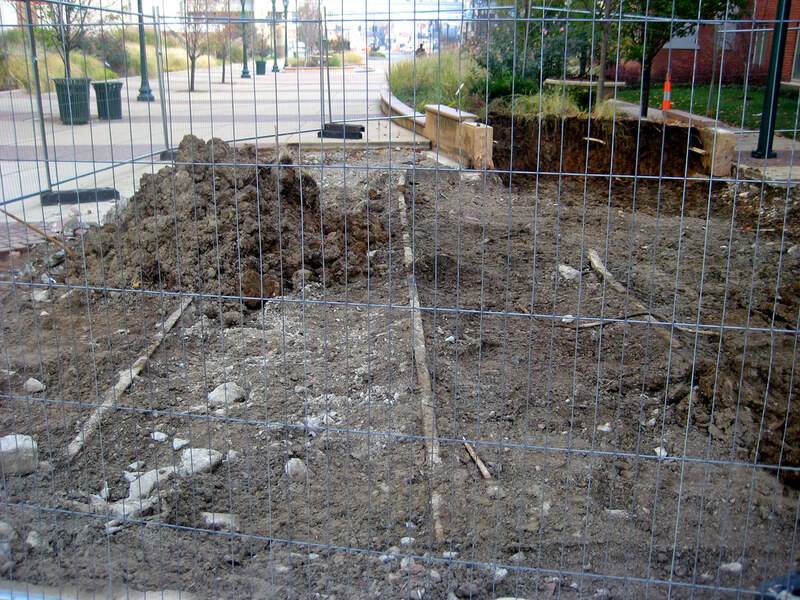 Less than a block north of the Central West End MetroLink Station some work is being done in the pedestrian mall that replaced Euclid Avenue south of Parkview Place several years ago at the BJC-WU Medical Center. Below the sidewalk pavement tracks form the long gone streetcar have been temporarily revealed. 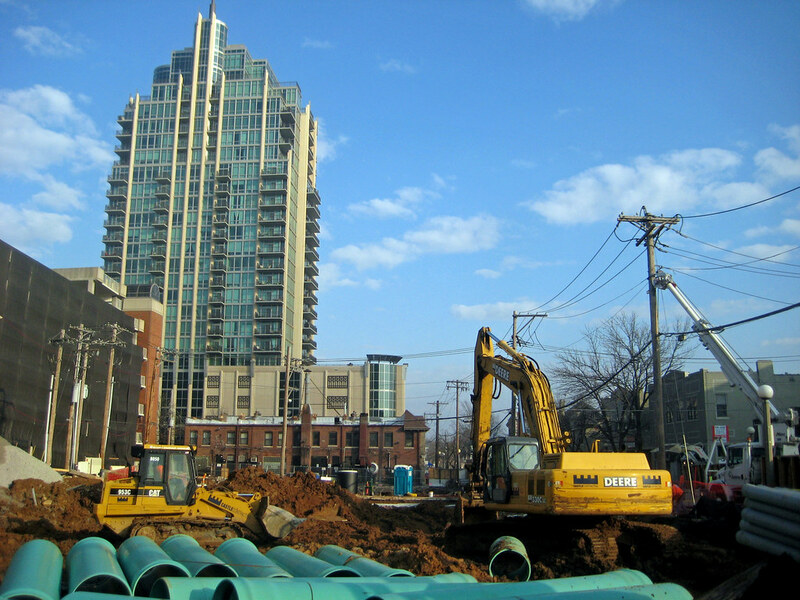 At the northwest corner Forest Park Boulevard and Euclid, sewer and foundation work has begun on the new 12 story BJC clinic building that will replace the demolished Ettrick and another building to the north. Farther north at 901 Euclid, is yet another example of a building that did not need to be demolished. This corner storefront building was not at the intersection of two streets, but at the intersection of Euclid and the Hodiamont streetcar line, which ran in its own right-of-way that was not part of a street. Located just two lots south of the homes that front Fountain Park, the building unfortunately was outside the boundary of the Aubert Place-Fountain Park Historic District. The surrounding area is part of the 18th Ward, which has been held back from Preservation Review by Alderman Terry Kennedy. 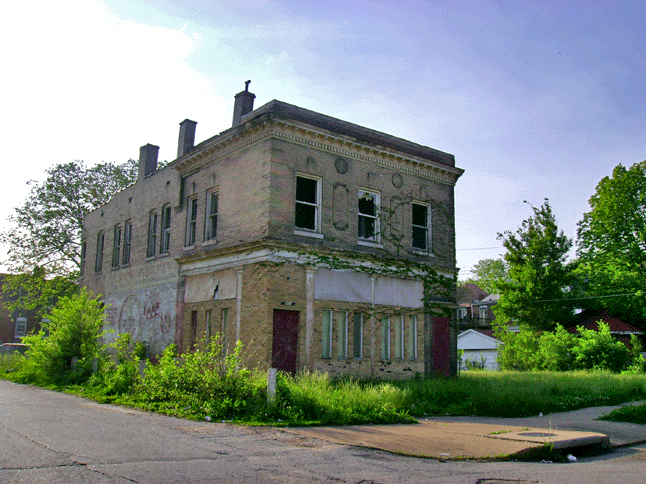 The photo above (from Geo St. Louis) tells the story of this building's demise. Like so many similar buildings, the back wall suffered a partial collapse likely due to continual water damage from a missing gutter. 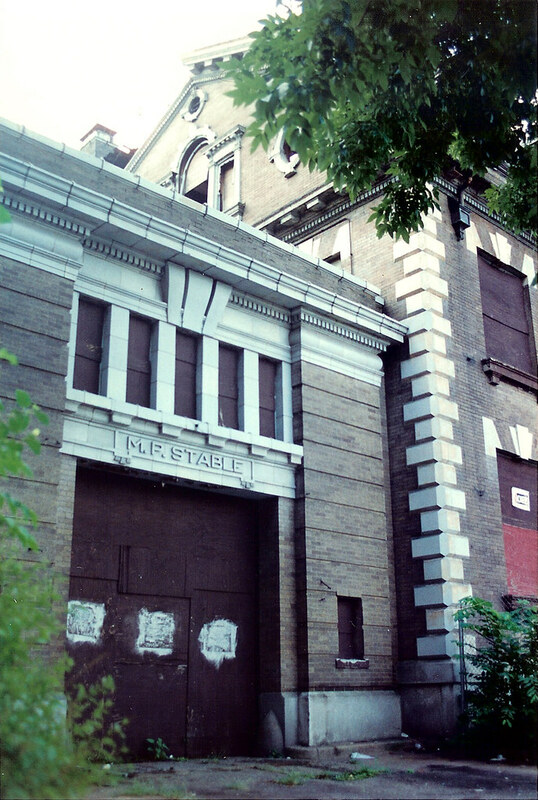 The building was condemned by the City Building Division in September 2005 and demolished in June 2007. The issue with this building is that the damage was reparable and since the floor and roof joists in these types of buildings almost always run side to side, the remaining structure was in no danger of collapse. So as is typical in a case like this, the building is needlessly destroyed.